Shanzi Dogs was set up because, being an owner of small breeds myself, I found that there was not a website where I could buy everything I wanted at the same time. Many times I thought to myself how much easier it would be if I could pop online, visit one website and find all that I needed in one place. And so, Shanzi dogs was born. I sell quality items for small breed dogs. Rolled leather collars and leads. First aid and grooming items. My own brand of natural products for pets, people and to use around the home. 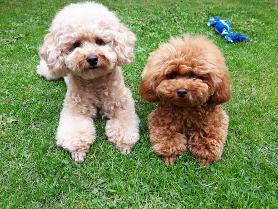 The name of the website came from my gorgeous toy poodle girls, Tanzi and Shayna. If you are looking for something in particular or have any suggestions, please let me know as I am more than happy to hear what you would like to be able to buy and I will do my very best to get hold of it for you. 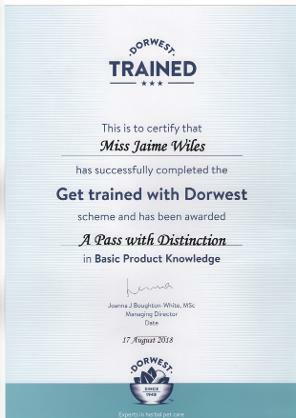 I am also Dorwest Trained which means that if you need any help or advice with any of the Dorwest Herbs products, I will be able to give you the advice you need. Also, if you have a general health query or problem (dogs or cats), I should be able to let you know if there is a product that you can give. Photo of my Dorwest certificate below. Please also take a look at the Shanzi Naturals range.